In the 1990s, an incredible revolution swept across North American dance floors—an underground revolution called the rave scene, where thousands of electronic music fans gathered together at secret events, and partied well into the morning to the most progressive, cutting edge beats on the planet. It was outrageous, controversial, and a pivotal moment in American pop culture. DANCEFLOOR THUNDERSTORM: Land Of The Free, Home Of The Rave is the new book that shows the American rave scene at its peak, written by one of the ultimate rave insiders—dance music photojournalist Michael Tullberg. 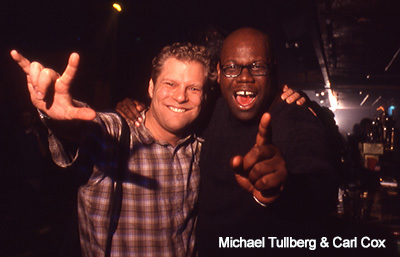 Photographing and writing for most of the major electronic music magazines of the day, including URB, Mixer, BPM Culture and Insider, Tullberg captured the rave scene in all its visually spectacular glory like none other. Reporting from the center of American rave culture, he amassed an enormous library of photographs, articles, interviews and memorabilia, the best of which make up the contents of the book. With hundreds of his tripped-out, psychedelic images and insightful words, DANCEFLOOR THUNDERSTORM takes the reader back on a blissful trip into the innermost heart of the rave scene—to the warehouses, after-hours clubs, deserts and mountains where rhythmic magic was made. It delivers VIP, backstage and on-stage access to some of the most groundbreaking electronic music artists in the world, and pulls back the curtain on the early days of classic festivals like Electric Daisy Carnival and Nocturnal Wonderland. More than just a snapshot in time, DANCEFLOOR THUNDERSTORM is a tribute to the men and women who catapulted electronic music into the public eye, and who laid the groundwork for the dance-dominated pop and EDM that tops today’s charts. Here’s what the media has been saying about DANCEFLOOR THUNDERSTORM! Frankie Bones, Carl Cox, Fatboy Slim, the Crystal Method, Moby, DJ Rap, Sandra Collins, DJ Taylor, the Chemical Brothers, Mark Farina, Doc Martin, Rabbit In The Moon, Freddy Be, Mick Cole, Von Shock, John Kelley, Superstar DJ Keoki, John Digweed, Josh Wink, BT, DJ Colette, AK1200, Jason Bentley, Mix Master Mike, Q*Bert, the Atomic Babies, Swedish Egil, Holly Adams, Christopher Lawrence, Mark Lewis, Doran Chambers, Robbie Hardkiss, Donald Glaude, Richie Hawtin, Mark Grant, Jesse Saunders, Juan Atkins, Jeff Adachi, Marques Wyatt, Li’l Louis Vega, Jason Blakemore, Electric Sky Church, DJ Mars, Jerry Bonham, Jason Splat, Mos Def, Eli Star, Ken Ishii, Danny Howells, Ferry Corsten, Deadmau5, Groove Armada, Basement Jaxx, SDF-1, the X-ecutioners, DRC, Paul Van Dyk, the Propellerheads, Bassbin Twins, Perry Farrell, Underworld, David Holmes, Roni Size & Reprazent, Massive Attack, Supaa DJ Dmitry, Z-Trip, the Prodigy, Kraftwerk, Mark Tabberner, Dan Wherrett, DJ Skribble, Johnny Vicious, Space Girl, Mousse T, MC ?, DJ Craze, Deep Dish, Westbam, Pete Tong.